Yikes this weekend was a little… uneventfully crazy. Since Penelope isn’t sick anymore she has emerged from her illness with quite the personality. 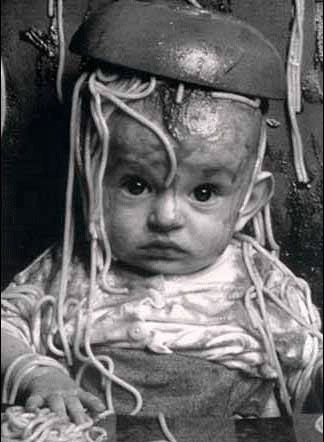 If this is any indication of our future together… I’m screwed. She won’t let me feed her with a spoon but if I let her feed herself she ALWAYS ends up gagging and throwing up every where but only after she has thoroughly coated herself in her food. I’m so glad the weather will be getting warmer soon because I have a feeling all of our meals with be eaten outside… naked, with the hose nearby. I’m also pretty sure I have given birth to the next Houdini. She magically manages her way out of any strapping mechanism. If I take my eyes off of her for two seconds I will turn around to see her prepping to jump out of the shopping cart or her high chair. I could chain her down in a straight jacket and she would still find a way out. She has also taken to head butting like a really pissed off Irishman. She must just be practicing for St. Patrick’s Day. I’m sure I’m going to look back at these days and laugh. But right now I have an eye that won’t stop twitching. I can already tell that her and Bridget are complete opposites. I have to drag Bridget out of the house to get moving. She’s more of the intellectual type who would rather stay inside and research Greek history because she has a character in her head that she would like to write a story about but feels it’s necessary to be historically accurate. When she was a baby she would sit in my lap for hours snuggling and reading books. That’s why I was super surprised this morning when she asked to go running with me after school. The only sport she’s involved in is swim and that is because Brent and I basically forced her to. We felt like she had to have some sort of physical activity and since she’s good at swimming we would give it a shot. She likes to swim but she wasn’t so sure about this idea. We kind of felt bad for making her do it but looking back it was the right choice. Over the year she’s grown stronger and more confident in her own skin. During the beginning of the school year she came into my room crying because none of her shirts fit right. She told me that she thought she was fat and I felt awful because I knew exactly who she was emulating. From that point on I’ve been really careful about how I talk about myself and the messages I relay to her. Instead I focus on how I feel after eating well and working out. I focus on the strength aspect of my journey more than I do the weight loss. That’s why I was really proud one day when she walked up to me after swim practice and showed me the muscles in her arm. 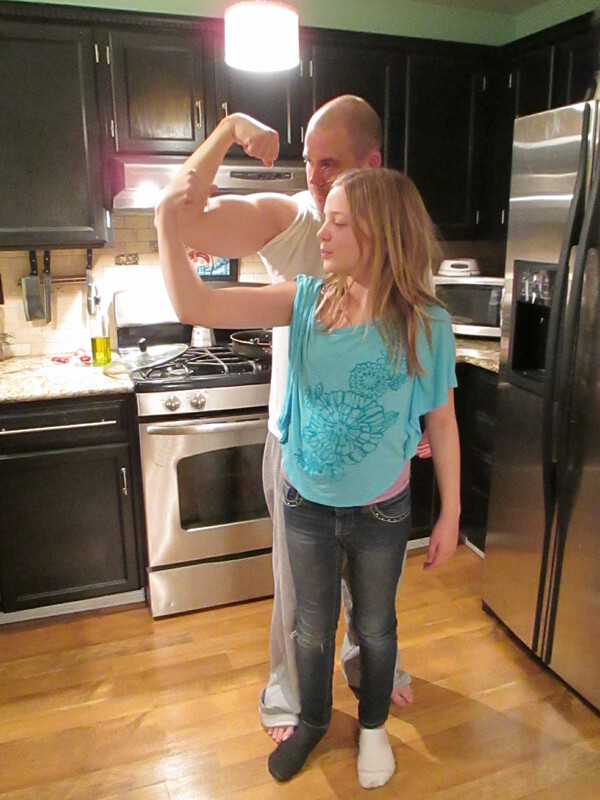 She was so proud to be getting stronger. She had to show Brent when he got home from work. I haven’t been able to workout because of all of the sickies so I looked up some at home workouts so that I could have a resource for times like these. 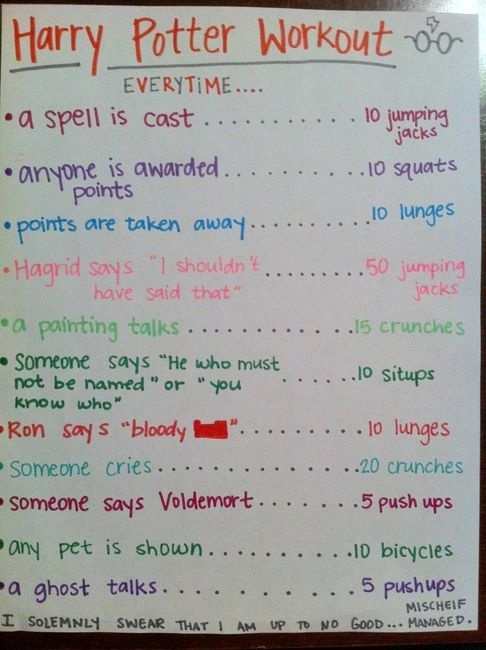 While I was searching I found this fun Harry Potter Workout. Bridget LOVES Harry Potter so I thought this would be a fun thing to do during the next snow day. … and then when she goes to sleep I’ll turn it into a drinking game. Here are the other links that I had found for working out at home. Harry Potter workout? Awesome. Harry Potter drinking game? Awesomer. My 7 month old has taken to gnawing on the table. We do provide him with various teething toys, etc…but nooooooo…he would rather gnaw on the table…and gets rather pissed off when we suggest otherwise. And by “rather pissed off” I mean screeching like a cat in heat. Have you tried giving Penelope a spoon to hold while you feed her with a different spoon? Maybe that’s too obvious.. Anywho, LOVE your blog!